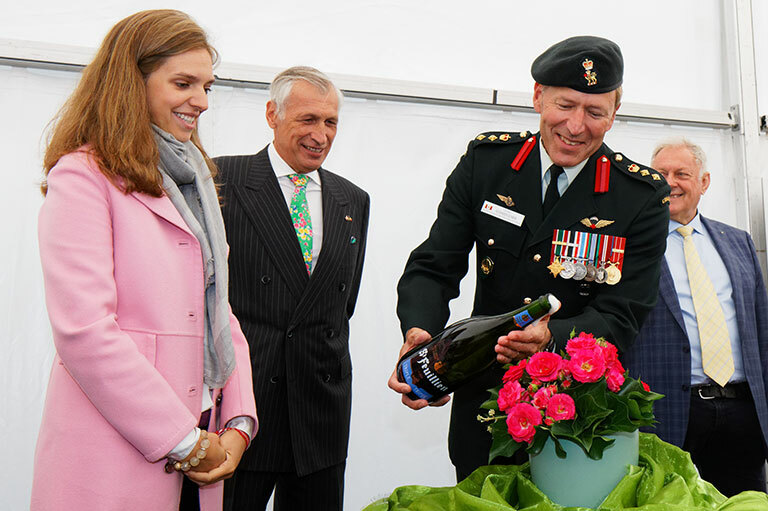 A rose species developed by a flower producer from Belgium was christened in honour of Private George Lawrence Price. A rose in Belgium was named in September in honour of the last Canadian and last Commonwealth soldier killed in battle during the First World War. Private George Lawrence Price died near the town Le Roeulx, Belgium, where the christening of the flower took place. His death came minutes before the end of the war on November 11, 1918, one month shy of his twenty-sixth birthday. Details about Price’s death vary. Some say he was killed by a machine gun, while others say a sniper. Some say he was part of a patrol, while others say he was alone. Today, his body lies in the military cemetery in St. Symphorien, Belgium. Christening a rose in honour of someone is almost exclusively reserved for royal family members, said McWhinnie, but the gesture was extended to Price because of what he symbolizes to people in the area. A flower producer from Belgium developed the rose species that now bears Price’s name. The species was successful at a local rose competition last year. At this year’s competition, the producer, along with the Ville du Roeulx municipal council, chose to christen the flower with Price’s name to mark the centennial of the end of the First World War, and of Price’s death. In attendance at the ceremony was Le Roeulx Bourgmestre (Mayor) Benoît Friart; la Princesse Hadrien de Croÿ-Roeulx, the godmother of the rose and granddaughter of Canada’s former Prime Minister Jean Chrétien; and Colonel Alexander Schwab, the godfather of the rose and grandson of Lieutenant Clarence Schwab from Niagra Falls, Ontario, who fought in the First World War. Colonel Alexander Schwab pours beer from St. Symphorien, Belgium, on the rose. Le Roeulx Bourgmestre (Mayor) Benoît Friart (middle) is CEO of a local brewery. During the Hundred Days Campaign, the final days of the Great War, Lieutenant Schwab would have come through the area where the rose ceremony took place. “His grandson now is wearing a uniform and helping make peace that his grandfather started,” McWhinnie said. In November, Le Roeulx will also honour the end of the First World War centennial by unveiling a memorial park, with the newly christened flowers planted throughout, dedicated to Price. The October-November 2018 issue of Canada’s History magazine features an article about Private George Lawrence Price. “The Last Man” was written by Ian Coutts. Key Canadian battles during the First World War led to the march to victory in 1918. Database recognizes veterans named on school memorials.